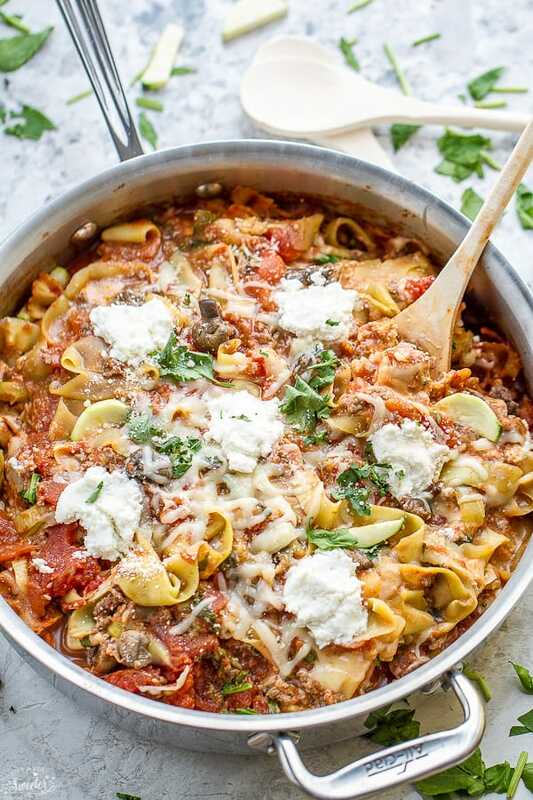 Healthy One Pan Zucchini Noodle Skillet Lasagna Zoodles – makes the perfect easy weeknight dish! 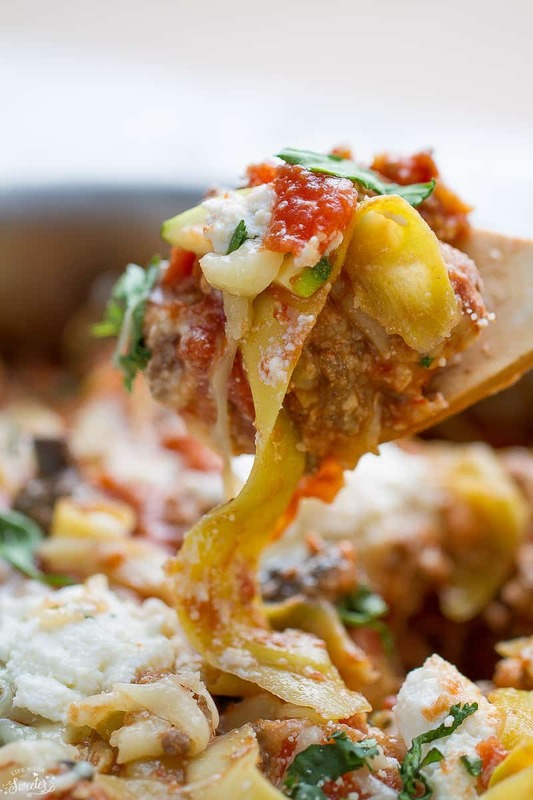 Best of all, it’s lower carb & makes a delicious twist on lasagna. 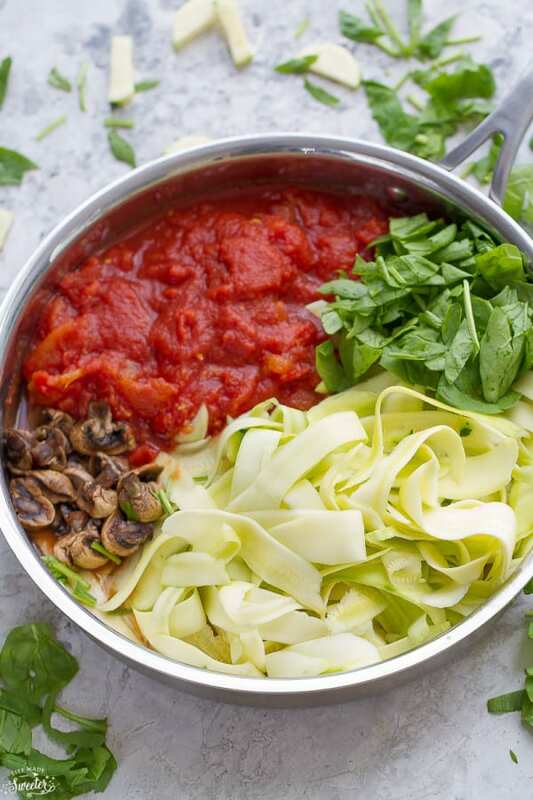 Gluten free – no one will miss the pasta with this dish! Plus a VIDEO! With the cooler temps headed our way, we’ve been wanting to drown ourselves in all the comfort food a.k.a. 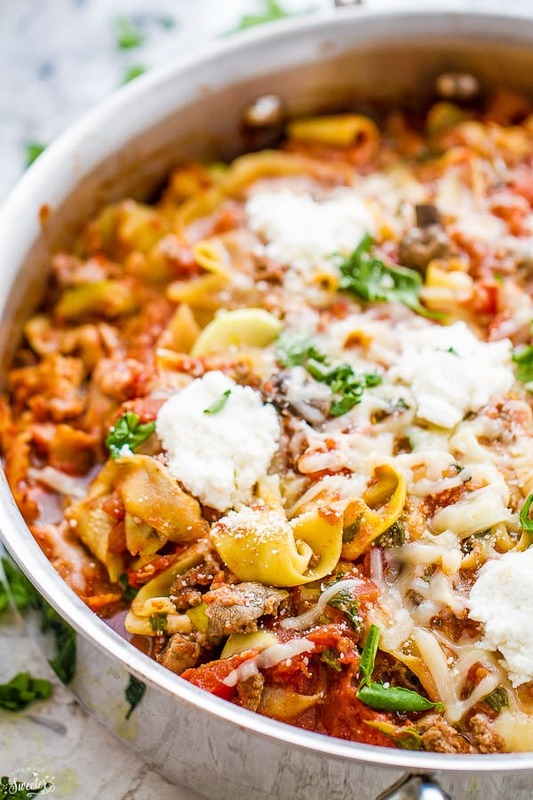 cheesy pasta dishes like this Easy Skinny Skillet Lasagna. 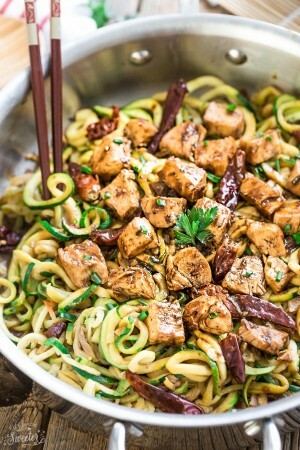 But since I had a bunch of garden zucchini still waiting to be used up, I decided to swap out the pasta for ribboned zucchini noodles (zoodles) instead. I love making veggie noodles for a lower carb option and you can use either a spiralizer or a vegetable peeler to get them into the wider ribbons which resembles the lasagna pasta more. 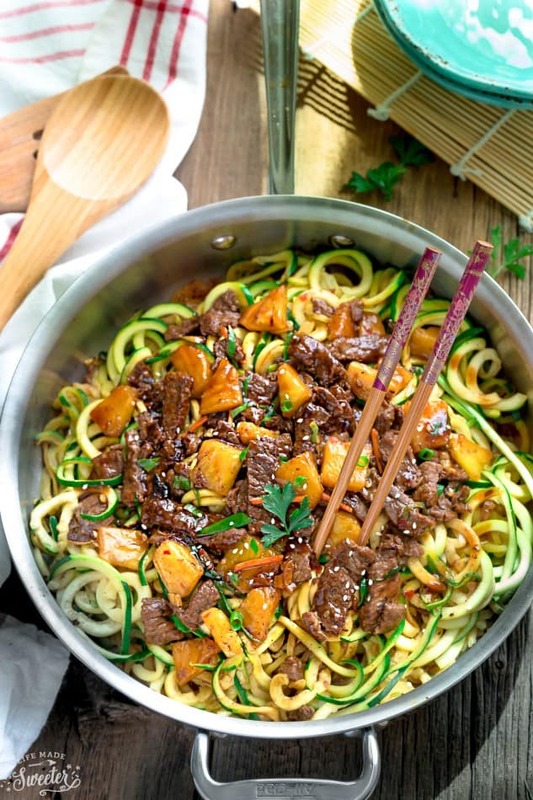 To avoid a runny and soggy sauce, it helps to pat them down with a paper towel after you’ve spiralized them to remove some of that extra moisture that zucchini tend to have. 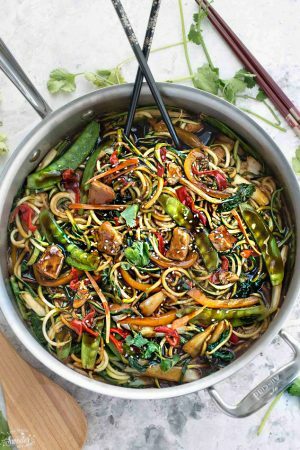 You can even keep this entirely meatless and add sliced mushrooms instead. I made two batches, one with ground turkey and one with sauteed mushrooms and they both worked really well. I used the same base as I did for my Easy Skinny Skillet Lasagna and just reduced the amount of water I added since the zucchini will release a lot of water on its own. 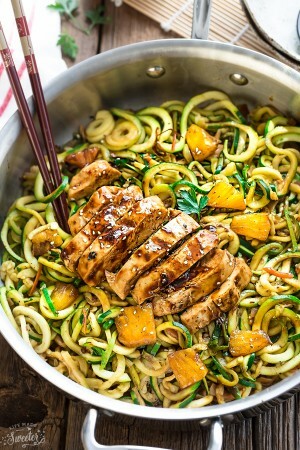 My husband absolutely loved this dish, in fact he couldn’t even tell these were zucchini noodles when he first glanced into the pan. He is not usually a fan of zucchini noodles so I’m so glad that he even requested seconds of this. 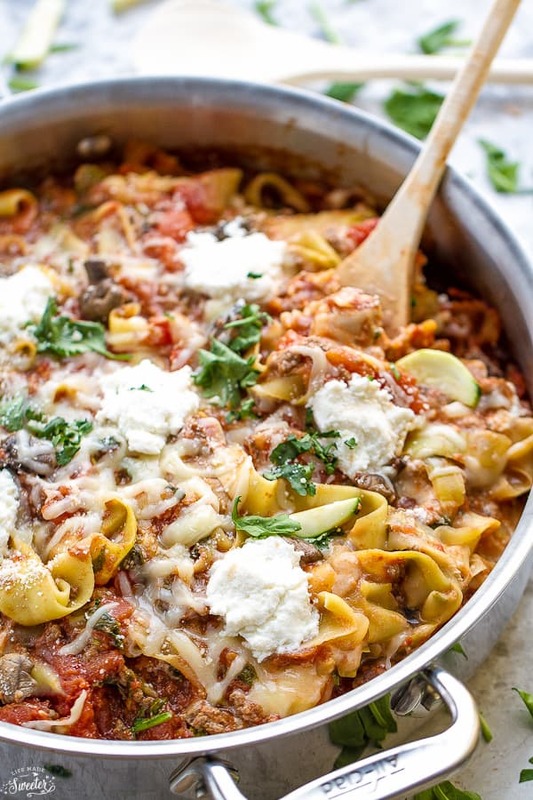 One Pan Zucchini Noodle Skillet Lasagna Zoodles - makes the perfect easy weeknight dish! Best of all, it's lower carb & makes a delicious twist on lasagna made with zucchini noodles, mushrooms and spinach. 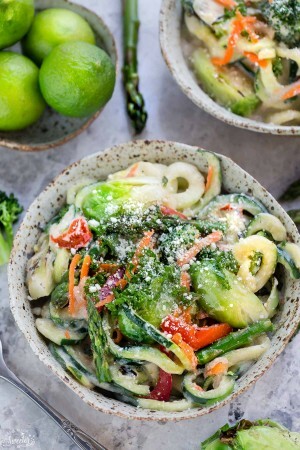 Gluten free - no one will miss the pasta with this dish! 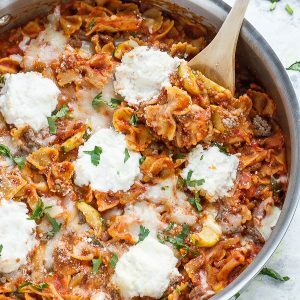 Heat the olive oil in a large skillet over medium-high heat, add in the ground meat and cook until browned, about 3-4 minutes, making sure to crumble and break down into small pieces as it cooks; drain excess fat. Add the garlic and saute for 30 seconds to a minute or until fragrant. Add mushrooms and optional chopped zucchini, if using and saute for 4 minutes. Season with salt and pepper to taste. Add tomato paste, diced tomatoes, tomato sauce, oregano, red pepper flakes and 1 tablespoon of basil. Bring to a boil and reduce heat allowing to simmer. Stir constantly until sauce begins to thicken (about 5 minutes). 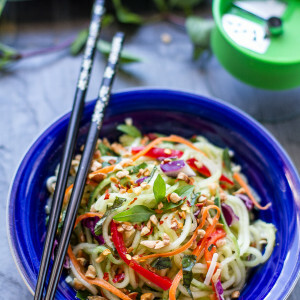 Add the ribboned zucchini noodles and cover with lid. After 2 minutes, remove cover, swirl the zucchini around using tongs to avoid sticking to the pan. Continue cooking until zucchini is tender (another 2-5 minutes). If adding spinach, stir in after 3 minutes and cover. Remove from heat and stir in mozzarella and cottage cheese. Taste and adjust seasonings as needed. Top with dollops of ricotta cheese. Cover with pan and allow to sit for 2-3 minutes or until the cheese has melted. Remove from stove and sprinkle with chopped parsley, basil and parmesan cheese if desired. Add water as needed if the sauce is evaporating. *If zucchini is letting out too much water, mix 2 teaspoons cornstarch with 2 teaspoon of cold water in a small cup. Add to the pan before adding the cottage cheese. Bring to a boil to allow sauce to thicken up. Add cottage cheese as directed above.